The speed and expense involved in getting to Bohol in the Philippines depend on your budget. Direct flights from Manila to Bohol's Tagbilaran Airport can get you there the fastest, but riding a passenger liner from Manila to Tagbilaran Wharf may prove to be more cost-effective. Bohol is accessible via air and sea links. Tagbilaran Airport (IATA: TAG) serves both domestic and international flights into the island of Bohol. The airport is located in the island's capital near the western coast. Reaching Panglao from the airport takes less than 30 minutes' travel by car. Alternatively, instead of flying to Tagbilaran from Manila, you can choose to fly from Manila to Mactan-Cebu International Airport near the city of Cebu (IATA: CEB), which happens to be only a two-hour fast ferry ride away from Bohol. Choose this option if you're up to making a side trip to explore Cebu, or if either budget or schedule make the Cebu route a better fit in your itinerary. The Philippines' largest air carrier, Cebu Pacific can fly you to both Tagbilaran and Cebu from throughout the Philippines and (if flying into Cebu) from Singapore's Changi Airport and Hong Kong's HKIA. As the Philippines' first low-cost carrier, Cebu Pacific offers cut-rate fares that can be had for even lower if you can catch one of their seat sales. Other carriers servicing Tagbilaran airport include AirAsia and Philippine Airlines. Travel tip: Tagbilaran Airport is hampered by a "sunset limitation" that bans any flights from coming in after dark. Reserve a flight earlier in the day, to prevent flight delays from turning into complete cancellations. Transportation to Bohol by sea can be arranged from both Manila and Cebu. From Manila, the shipping line 2Go arranges once-a-week voyages to Bohol's Tagbilaran City. Scheduled voyages depart from the Eva Macapagal Super Terminal at Pier 15, Manila South Harbor. The voyage takes about 28 hours to complete. Passengers disembark from Tagbilaran City Wharf, within Bohol's capital city. From Cebu, travelers can take fast ferries that disembark at either Tagbilaran or at the more northern port of Tubigon. Cebu to Tagbilaran, Bohol: Fast ferries take two hours to travel from Cebu's port area to Tagbilaran City. SuperCat, OceanJet, and Weesam Express travel this route regularly. 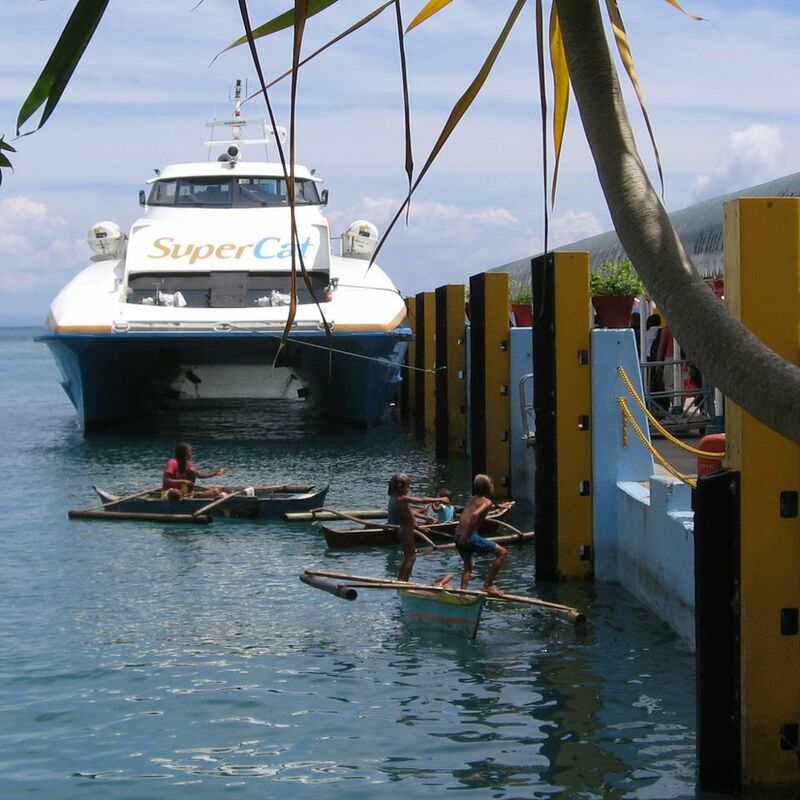 SuperCat and Weesam depart from Cebu's Pier Four; OceanJet departs from Cebu's Pier One. Cebu to Tubigon, Bohol: Travel from Cebu to Tubigon is about thirty minutes shorter than the Tagbilaran route. Fast ferries to Tubigon depart from Cebu's Pier Three. Travelers heading to Tubigon can book trips on board MV Starcraft and MV Sea Jet. Both Tagbilaran Airport and Tagbilaran City Wharf are located within Tagbilaran City limits. Outside the arrival areas of both ports of entry, you'll find plenty of for-hire vans, taxis and tricycle drivers waiting, aggressively touting their services. Taxis will gladly take you to Panglao but will charge double for the ride, as they have no guarantee of a return fare on the way back. Many resorts and hotels around Bohol provide free airport pick-up for their guests. If you're traveling on a budget, take the tricycle to the Integrated Bus Terminal (IBT), a large public transport hub adjoining Island City Mall and Dao Public Market in Tagbilaran City, not very far from either the airport or the wharf. Air-conditioned and open-air vans, buses and jeepneys depart from IBT to all points in Bohol. Ask around to find out what bus or jeep is going your way.